These are my notes from watching Keith Lango’s video series on his workflow for a shot of animation. It’s useful to see how much of his workflow focuses on key poses, primary breakdowns and secondary breakdowns (stepped). He spends most of his efforts on these poses, making sure that the drawings of the silhouettes are simple and have appealing curves. A lot of time is spent on creating arcs in the movements. These poses are then timed out. The splining phase is relatively short as the poses, arcs, and timing are working well before this stage. Start with the emotion of the character. Look for the shape of the dialogue. What is the energy of the dialogue? Does it pop up and crash, rise slow and crash etc.? Study the line of action of different poses in the body mechanics. Even when the feet are off screen you will still be able to sense the balance. Think of feet as the foundation. What direction will the feet point to convey the stance? Emotion affects the pose of the action. Act out the motions and take note of what all your poses are. Understand what your body is doing, by doing. 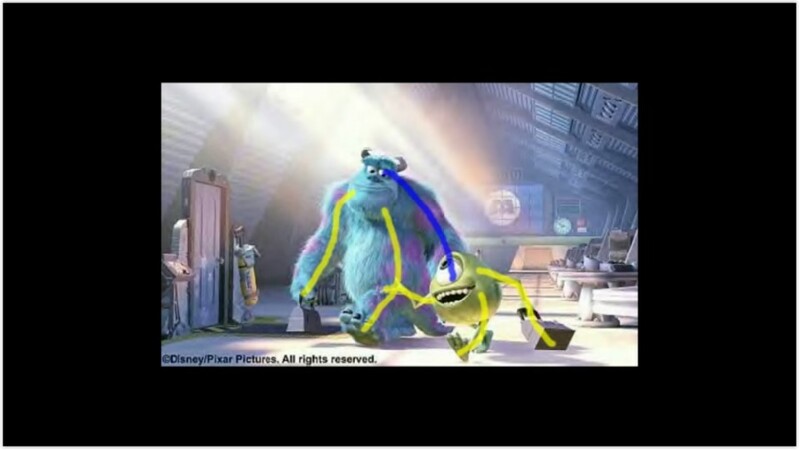 Animation is the believable condensation of life. Thumbnail your motion analysis; keys and primary breakdowns. Start by thinking through the motion (planning). Create counter rotations for curves in the spine. Start with the hips (the point of movement in the example). Pay attention to the curves in the silhouettes of the poses. Pose reversal. Offscreen poses can still affect on screen poses. Build asymmetry in the facial pose. Think from squash to stretch and closed to wide in the facial pose too. In the example, Lango is aiming for an under-arch. Think about the timing of separate actions e.g. the head comes through the door almost at the same time as the door opening. This will then determine the position of objects along their motion path during the inbetween. Think of how the limbs will be offset on the inbetween. What is moving faster/leading versus dragging? The core of the body/hips can act as the carrier of the upper body if the hips are the pivot, therefore arrive quicker. Think of the changing angles. Rotate angles of moving parts but find a balance. You want the torso to feel alive but not be distracting. Always consider ways to improve your key poses in the context of your breakdown too. Think of how the silhouette morphs between poses. You don’t want it watery or strobing. Keep an eye on the poses which Maya tries to fill in. Pick points in the silhouette that might stay in the same place. Think of the drawings. It’s all just shapes moving on a 2d screen. Build the primary breakdown in the middle and then the smaller breakdowns like eases. The primary breakdown defines the nature of the move. Draw a line between the key poses and primary breakdown. Get feedback after the primary poses and after the secondary breakdowns both. Start by planning, then space the frames according to your plan. The action should hit a few frames before the sound. Depending on how fast and slow the movement is you will need to add more ease to make the movement visible. Start with the hips and move up the torso. Clean up the peaks and valleys of the graph. Clean up your geometry penetrations. Lango adds extra character to the rotations after the f-curves are polished. Dialogue animation is emotional. Get your narrows and wides and the jaw moving and focus on emotion instead of the nitty gritty sounds. Every shape is unique, we’re not robots. Start with the bigger shapes e.g. the squash of the eyes and then work smaller. Make sure that the shapes work in an emotional way. Offset the timing of different parts of the body. Everything doesn’t usually arrive at the same time. Look at the Treasure Planet (2002) scene where John Silver offers his knives hand. Look at flow, weight, emphasis of space. The hand goes out first and the body settles in after. Actions like this can’t be made by simply offsetting the keys. This is why we need forethought and planning when creating our poses. Flow and rhythm. Think of where you want your point of emphasis e.g. the hand is in contrast to everything else in the scene above. Emphasis can be created by moving at a different time – late/early- and also by timing fast versus slow. What needs to be emphasized for the story? i.e. Think through the scene. What needs to be looked at? Emphasize this with offsets. Creating pose ‘a’, breakdown and pose ‘b’ and then offsetting in the dope sheet can lead to unexpected/unwanted results. Possible alternate solutions: Build your drags and offsets into the breakdown. E.g. In an arm and torso twist – Hold the arm back longer compared to the turn of the torso. Then add another pose/drawing where the arm arrives later. Think also of how the torso eases in. The torso could still be slightly easing in as the hand arrives. Think of the mechanics of the weight happening. Build breakdowns from what the computer gives you between pose ‘a’ and pose ‘b’. Micro anticipation – something you feel rather than see. A micro-anticipation will give more pop and energy to your action. Don’t do it with whole body e.g. head/shoulders/elbows as this will create a stutter. 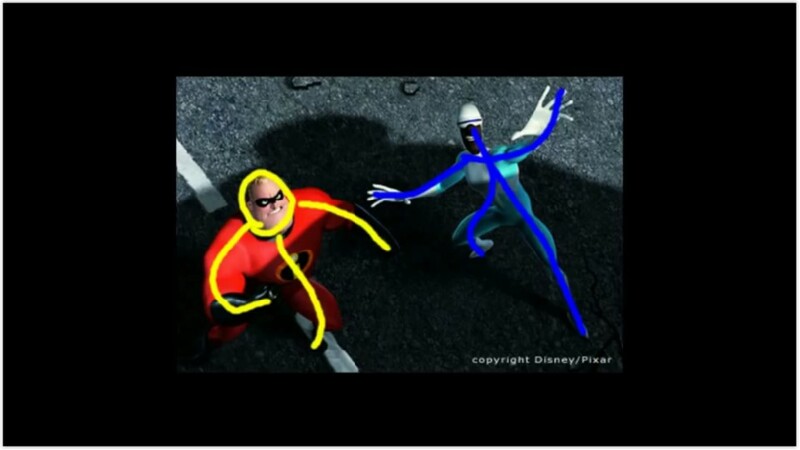 You can also add smear poses (like smear drawings), where the form elongates, during a fast movement. This creates a feeling of flow in the forms. Lango’s VTS06 and VTS07 provided some great revision for breakdowns, anticipation and eases. Seeing Lango’s blocking workflow, which we also looked at a bit last year, was also useful. Thinking this way might help us for blocking out a lip sync/acting scene if we get time to try it as part of our project. I think Lango will be going through this more in later videos. Breakdowns: making stuff move. It helps define the flow of imagery from one pose to another. The speed of the action determines how big the breakdown needs to be i.e. timing determines breakdown intensity. Fast moves usually require more intense breakdowns. In this way, we can see the breakdown intensity as being proportional to the energy required to move a weight – more energy is needed to quickly move a weight. However, greater distances across the screen also require more interesting breakdowns. Anticipations: a sub/minor pose, of varying degrees of intensity, that announces something is going to happen. Anticipations, like breakdowns, are dependent on the timing and distance of the move. To make things move, you need energy. If a large move is going to happen within a small timing then a large anticipation will be needed to show the build-up of energy. Showing the build-up of energy creates the expectation/anticipation of movement. Eases “are your primary tool for spacing” (but not the only tool). Eases also create weight. You don’t need a slow in after a big anticipation. Be mindful of what you need to use. A large anticipation followed by a large release of energy might make an ease-out look strained. Try a ‘settle back’. Think of where the energy is needed to build up and where it is lost after the move. Make your own fcurve rather than relying on an inorganic cg made curve. Blocking – block out the main poses/drawings (plus lip sync of syllables). Space out the poses to where the lip syncs are. Before you think of timing, just focus on what the poses will look like on certain syllables of what is being said (plan ahead). Try and figure out as much as possible through these initial poses: weight, arcs, drags, squash and stretch etc. Try to capture what the character is feeling through each body part. Space out the poses to where the lip syncs are. This blocking-workflow allows you to fix poses independently without having to worry about timing yet and vice versa. Fill in the eases to understand where the energy flows. I started this tutorial from Digital Tutors in September and only got around to finishing it in November. It was a great introduction to getting my head around walk cycles and it was also very helpful for understanding the graph editor better. There are so many ways one little movement can be tweaked! 2. Setting up the scene – frame rate and tangent type. Tutor starts with a frame number of 33 (length of cycle) and creates the poses on odd numbers with even spacing. The midpoint falls on 17 for a symmetrical cycle. Lock down the first and last frame to avoid popping. In the graph editor – set post and pre infinity cycles. Set view to infinity to see how these curves blend together. Make sure the arms are set to fk as this is good for walks and runs. The rotation axis may need to be set to gimbal and the rotation order may need to be changed under the attribute setting. 3. Beginning the walk cycle – Plan the poses. For the first pose – lower the character, extend the legs, pose the heels and open/rotate the hips. Lean the chest forward for balance. Counter move the swing of the arms. Pay attention to the angles of the shoulders, elbows and wrists – and also their distance from the body. Pose the fingers and then copy the first pose onto the last frame. 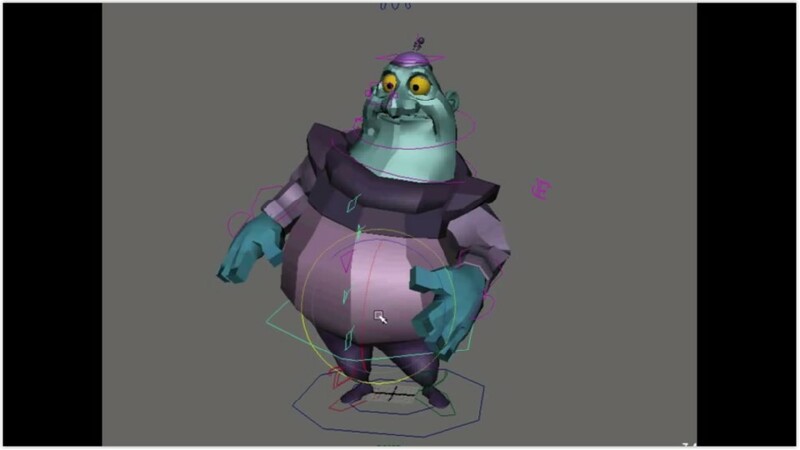 To copy this pose onto the last frame – while on frame 1 select the animcharacter set, middle mouse click on frame 33 and then hit ‘s’. 4. Finishing the contact pose. Switch the values of each foot onto frame 17 (mid frame). This way we will be working with the same extension for each foot as a base. Enter the reciprocal values of hips and chest also. Transfer the reciprocal values of ‘y’ and ‘z’ between each shoulder and then copy the ‘x’ values. We then need to fix the curve of the foot movement back and forth so that it moves at a flat rate – linear tangent. 5. Adding the down position. These positions will be on frames 5 and 21. Plant one foot firmly on the ground to carry the weight and roll the other to start into the lifting position, then do vice versa for frame 21. Exaggerate the down position on frame 5 and 21 by bringing the body down. Adjust the weight in the heels by bringing the heel keyframe forwards by two frames. 6. Completing the extremes – Bring the character to it’s highest position on frames 13 and 25. Start to plant the heel on 13 and plant it fully on 9. Copy the keyframe over to the opposite side of cycle and make sure the tangent is flat. On frame 9 make sure the passing position is high but not as high as the peak position in frame 13. Use the graph editor to flow the curves together. Copy and paste the value into frame 25 also. Check that the cycle is working with playblast and remember to knock off the last frame. Smooth the transition between the cycle and infinite cycles. To reduce locking of the knees from over extension – shift select the contact keys and move the character down slightly. Increase the degree of the foot roll by selecting the rotate x of the ball roll on frames 1 and 33 and moving up in the graph editor. Copy and paste this value into the other foot. Check if the heel comes far back enough and if not, adjust with the translate z in the graph editor. Adjust the curve of the foot roll between frames 25 and 33 – delete the key on frame 29, break the tangents and adjust the curve to fix any popping. Do the same on the other side. 8. Balancing the character in the front view. 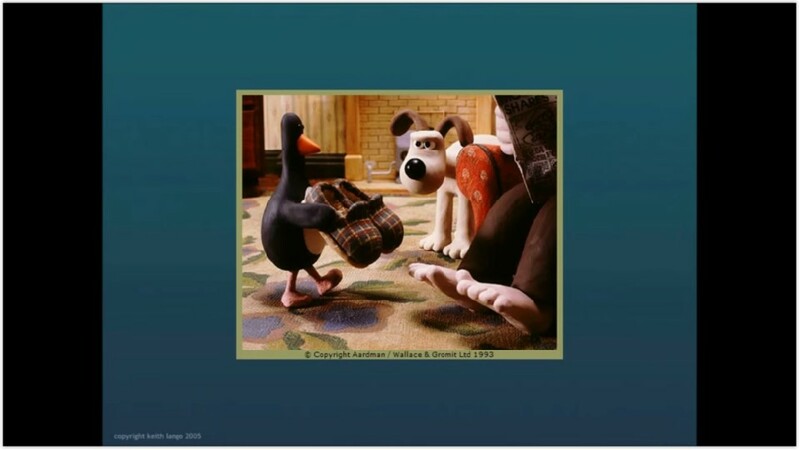 Think of where the weight is being shifted as the character moves from foot to foot. Shift the weight on frames 9 and 25 to the leg that’s carrying the weight as the other leg passes. Smooth the curve between cycles. Next consider how the foot arcs from side to side as it goes back and forth. E.g. It goes out on frame 10 as it passes and comes closer to center line as it plants. To keep the foot straight and then angled – paste the keys from frame 17 onto frame 1 and 33 i.e. The foot won’t be slanted as it moves back. Copy the reciprocal values across to the other foot. Rotate the feet to angle outwards by selecting the rotate y keys in the graph editor and moving them. Then rotate the whole foot slighlty on the z axis as the foot comes up and forward (frame 8 for right_foot). It then rotates the other way (outward) soon after, on frame 13. The foot needs to be planted on the contact pose so zero out the rotation. Use the toe z control to bend the toes back as they move forward – follow-through/drag action from the force of moving forward. Then when the foot is about to plant bend the foot backwards. Fully plant a few frames later. To give this more weight move into the graph editor – break the tangents. Make the tangent of toe z fall more abruptly. Blend the fcurves between post and pre infinity cycles. The hips fall towards the leg that is lifted and stays high on the support side. Rotate ‘z’ on the down positions. Create moving holds between 5 and 17 and the reciprocal between 21 to 33. Break the tangents and make the curves snappier to create a feeling of weight. The body rotates back and forth on the rotate ‘x’ – back on 5 and forward on 17. Then animate the side to side on the rotation ‘z’. The body rotates away from the forward arm. Rotate ‘z’ on frames 1 and 17 with reciprocals and enter the same values into 1 and 33 for a smooth curve. The chest follows through with the upper body rotation. Rotate the chest back on 5 and forward on frame 17, back on 21 and forward on 33. Offset/move the graph a few keys right and enter new keys on 1 and 33 to keep the graph within range (outside of the pre and post infinity cycles) and make sure they blend by breaking the tangents. The head moves back on 4 (moving into down position) and forward on 9 (the passing extreme). Copy these keys to the equivalent frames on the other side and blend between the infinity cycles. Then offset the graph for follow through action. Shift one frame to the right for delay. Add weight by making the animation/graph tangents snappier where the head falls forward. Correct the rotation of the head so that he’s looking forward throughout the cycle. Correct the rotate ‘y’ on 17 and then paste the reciprocal into frames 1 and 33. Now add tilt from side to side on the rotate ‘z’ and follow through. Tilt the head towards where the weight is being planted. Now loosen up the neck using the translate values of the head. We want to add the weight from the forehand and wrist onto the motion of the upper arm. This can be done by selecting ‘weighted tangent’. Then select the key and select ‘free tangent weight’. The tangent handles can now be stretched allowing you to adjust timing and spacing without adding any more keys. Break the tangent to influence one side only. Note – you can pin curves to keep them on display. The weight of the tangent can also be edited by selecting the keyable attribute’s node from the hypershade, opening the attribute editor and edit the values in the spreadsheet found here. Create an arc as the arm swings – it swings outward as the arm moves forward and it moves closer to the body as it moves back. Keep in mind weight and momentum. 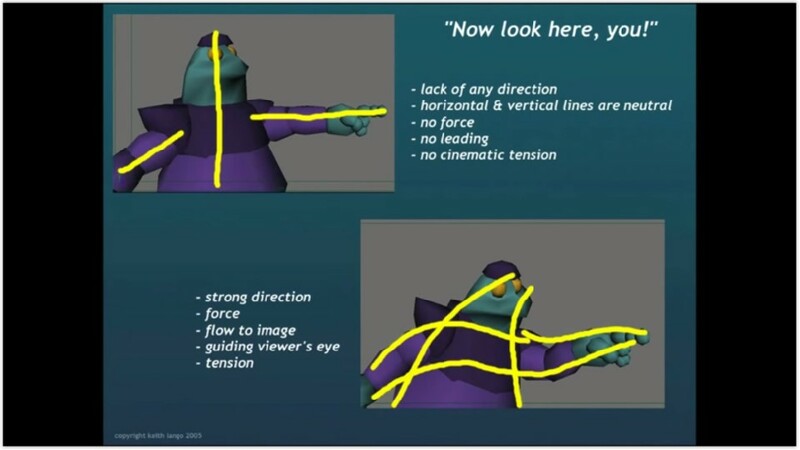 As the arm starts to swing back the elbow will still be going up – animate in the rotate ‘y’ axis. As the upper arm swings back the weight of the lower arm will carry it forward quicker. Create drag by making the f-curve overshoot the key. The arm drags as it starts to come back up. As the arm starts to pull back the wrist will rotate up and as the arm moves forward the wrist will move back (y axis). Also pay attention to the wrist rotation on the z axis as it rotates away and into the body as the arm swings forwards and backwards. The wrist rotates inward as the arm moves forward and outward as the arm swings back. Add follow through from the shoulder to the arm. Delay all the shoulder key frames by about 2 frames. Translate forward on a linear curve. Make sure that the curve for the foot planting forward is linear to prevent the appearance of sliding. Compare the planting pose to the translating forward and adjust until there seems to be no sliding. You can add controls to animation layers and make the character do an action e.g. a head turn that breaks the repetition of the cycle. This video was useful for understanding how timing can be broken down and thought of as different sub areas. The analogy of timing, spacing and phrasing as a sentence was particularly helpful. Timing and posing greatly rely on each other to create weight and believability. Timing is how long it takes to get from pose a to pose b. Timing has to be acted out. This cannot be figured out from your chair. Get the poses right and then figure out their timing. Spacing is the speed within timing, the lingering and rushing. Spacing creates the character. Phrasing – is timing and spacing within context. Phrasing is how the timing and spacing of each sub action is arranged together to emphasise the most important action of the scene. Timing is like the words in a sentence, spacing is how fast or slow each word is said to give the sentence character/flavour and phrasing is how each sentence is put together in a paragraph to lead to a point of emphasis. Be aware that timing problems need to be fixed by changing the timing and pose problems need to be fixed by changing the pose (even though both inform eachother). I bought Keith Lango’s Video Tutorial series at the start of the year but haven’t put enough time into going through them yet, and more importantly putting them into practice! I’m almost finished going through the first 11 which deal with posing and timing – topics which apply to a lot of our projects! Don’t simply plan the pose according to silhouette. Think of natural postures that convey weight. Animation is a contrast of motion against stillness. Try out the pose and see if your body protests. Think of the weight in hands, how far out the elbow is, the slope of the shoulders. Build some sort of curve in the torso to give a sense of compression. Contra hip direction. Only show it if you use it. Staged at an angle is usually the most natural staging of a character – keep in mind the visibility of both eyes versus a profile view. Emotions are read through the eye area. 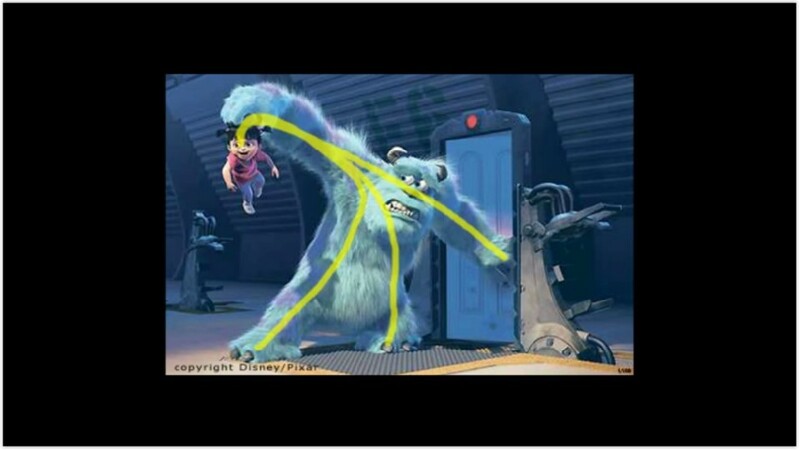 Similarly take into account the angle at which the character enters the screen to act. Also watch out for gestures that cover the body such as offering a hand – use the hand furthest from the screen. Do you want the audience to see what the character is doing? Thumbnailing weight in poses: Think of the head, the chest and the hips as three weights placed on the line of action. See the pose as you would in life drawing – make the line of action dynamic as opposed to stiff and straight. This works for all character proportions. Use both introverted and extroverted poses for contrast. e.g. a pose where the character has her/his limbs close to the body, thinking versus a pose with the arms open in a wide gesture while expressing what’s been said. Think of the body as been contained in a bounding box which the character can move in and out of. The extroverted movements can also be expressed by moving closer to the screen. The audience is generally more comfortable with characters that know how much space to give and aren’t always super close. Pose the lower body with weight even if it will remain off camera – the weight/absence will be felt throughout the entire body. Don’t crowd a close up with hand gestures. You know a gesture is happening off screen by the shift of weight. My notes from Keith Lango’s VTS 2: Creating Good Poses Part 2. Flow lines: All parts of the character work together to create the pose. We might focus on the face but we should also feel the body language. Draw the viewer’s eye to the character’s face or to another focal point. Don’t force the silhouette if it breaks the flow lines i.e don’t have unnecessary elbows sticking out. Whatever your character is holding is part of them so work props into the flow line. Flow can lead the viewer’s eye through more than one point. Tilt the head: adds life, weight and accentuates line of action. These are my notes from Keith Lango’s Video Tutorial Series 1: Creating Good Poses. Good poses communicate the character immediately. The story only has meaning if we care about our characters. Character is king. Two elements make us care about the character: appeal and emotion which are both found in the pose. Appeal: A character has appeal if they’re immediately identifiable and their feelings/thoughts are easy to read. Emotion: what they’re feeling tells you who they are as a character. How a character holds her/himself tells you who they are. Good poses = Good Storytelling. Look at you 3d characters from a 2d standpoint. That’s how the audience experiences them. Great poses still have motion in them. Look at the line of action even in a stationary character. Lead the eye. Primary line of action indicates the general force in the character’s pose. Reversing the line of action builds contrast in your poses (from screen left to right). This follows the build up and release of energy. Vertical lines of action are good for emphasis but, like exclamation marks, should not be overused.